Last year, Google released an open-source web project called Topeka. The project demoed the power of Polymer and material design on the web, and aimed to give developers some direction on how to execute material design in their own projects. 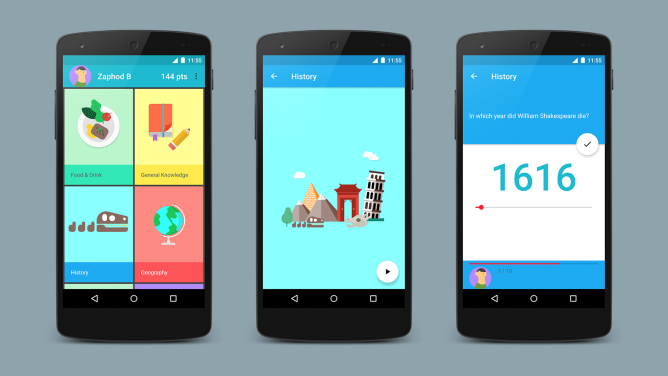 Today, Google announced an Android version of the demo quiz app, available just like before through Github. The app covers a lot of ground, including elements like the FAB which are included in the new design support library announced at I/O. Transitions, animations, FAB placement, and even vector drawables are all represented beautifully. To get a look at the code, head straight to the Github project or check out Google's post on the Android Developers blog below, which walks through some of the awesomeness contained within.